Years of cleanup efforts are just beginning in Texas, Florida, Puerto Rico and elsewhere following a spate of hurricanes and subsequent floods that ripped through the United States since August, causing billions of dollars in damage. But five years after Hurricane Sandy struck the shores of New York and New Jersey, some homes and buildings have yet to be fixed from its powerful winds and storm surge, as advocacy groups and residents question whether the region is moving fast enough to prepare for the next major storm. That scenario shows the quandary facing coastal communities across the nation and the world as they grapple with ways to contend with the looming effects of climate change, with studies suggesting that the combination of hurricanes and rising sea levels caused by global warming will mean more damage in the coming years. 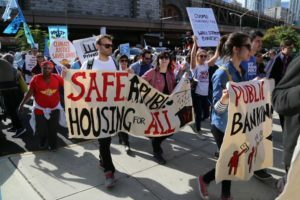 On Saturday, hundreds of people took to the streets of Brooklyn and Manhattan to draw attention to those issues, and to call for better action plans in New York and nationwide. 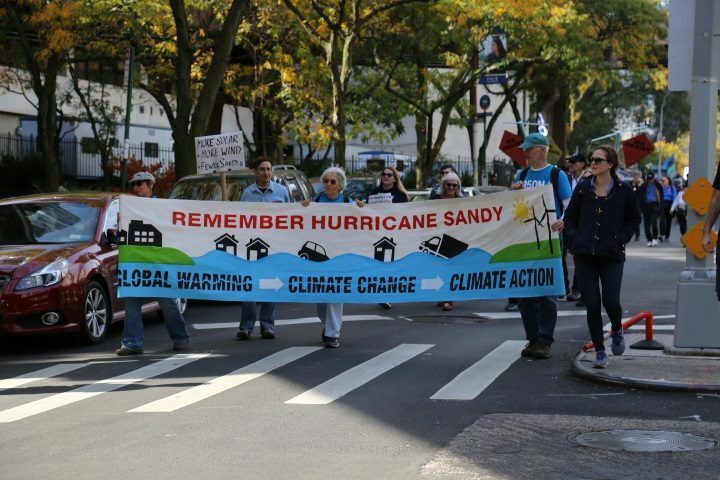 A group called Sandy5, made up of a coalition of more than 100 organizations from around the country, led the march, highlighting what they see as a failure of government action in the aftermath of Sandy, which killed at least 147 people and caused more than $70 billion in property damage. Members of Sandy5 said 32 public housing buildings damaged by the storm have yet to be fully repaired. Of the 150,000 people who were affected by the storm in New York two-thirds were living in public housing units, mostly low-income people of color making an average of less than $24,000 annually. Betamia Coronel, U.S. reinvestment coordinator at the New York-based climate advocacy group 350, said municipalities including New York City “are not necessarily prepared to take on another disaster” such as Hurricane Sandy. “This situation calls attention to not only how long it’s taking to get repairs, but also that we’re seeing devastation after devastation hit our country,” Coronel said. New York City officials say they are addressing the threat, citing billions of dollars in reconstruction for communities struck by Sandy that often include new modifications like elevating homes to protect against the prospect of flooding. A Rutgers University study, published in PNAS on Oct. 23, predicts New York could soon face historic flooding every five years. Daniel A. Zarrilli, senior director of climate change policy for the City of New York, said 10 miles of sand dunes have been placed along the city’s shores, and a boardwalk at Rockaway Beach in Queens was rebuilt and integrated into a coastal protection plan. He said the city is nearing the start of a plan to offset future flooding. The 10-mile barrier called “The Big U,” will wrap around southern Manhattan. The first phase is expected to kick off on the east side of the island in 2019, using $355 million in federal funding. And Mayor Bill de Blasio on Sunday said the city would use $145 million to bolster the shoreline of the Rockaways from future flooding, including seven projects that would raise some areas of shoreline and add berm and seawalls. Rachel Rivera, 38, who took part in the Saturday’s march, said she is still trying to rebound from Hurricane Sandy five years after she and her family were displaced when heavy rains caused the ceiling of their Brooklyn apartment to collapse. Rivera, a mother of six and a cancer survivor who has had multiple sclerosis for years, said she lived in a hotel for months after Sandy. Several of her children moved in with a relative after she had difficulties finding a new low-income apartment suitable for the whole family. One of Rivera’s children is contending with post-traumatic stress disorder after their lives were uprooted by Sandy, she said. “Right now I’m just trying to get my family get back together,” she said. To make matters worse, her relatives living in Puerto Rico are struggling to find enough food and water after Hurricane Maria tore through the island in late September. Her mother, a 73-year-old diabetic living in the northern coastal city of Arecibo, can’t find enough medicine for her disease and is still without regular power. “I lost everything and my mother lost everything in water,” she said. In New Jersey, cleanup efforts have been slow in sections of the state, even as redevelopment projects push forward, and as rising sea levels threaten to displace hundreds of thousands more people from their homes. But rebuilding is a mistake said Tony Choi, who lived on the third floor of a multi-unit building in the town of Little Ferry, New Jersey when Sandy hit. Little Ferry rests along the Hackensack River, a waterway affected by tides in an area prone to flooding, according to the state. “Whenever it rains I get nervous,” Choi said. Choi, a DACA recipient who didn’t receive federal assistance because he was undocumented at the time, said he lived “two or three weeks” without power and had to scrape together enough money to get by, including repairing two vehicles that were heavily damaged by water. The Big U plan has been criticized by Sandy5 because they say it wouldn’t do enough to protect the city’s most vulnerable populations. 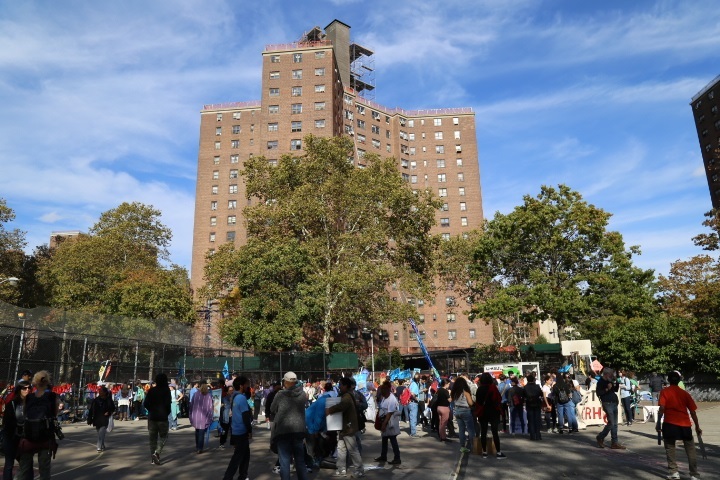 But Zarrilli said construction would focus on the lower east side of the city first, because it sits on an “extensive floodplain” and is located in an area with a significant amount of public housing. Some researchers predict that more than 13 million coastal residents in the U.S. could be driven from their homes because of flooding related to climate change. And that’s one of the issues that Rivera said worries her most. Michael D. Regan is an Associate Multimedia Producer for PBS NewsHour Weekend.